Expand your kitchen storage possibilities with Davenport Kitchen Cart with Granite Top. This elegant rolling cart combines materials and finishes beautifully to enhance any space. It includes a built-in towel holder, storage drawer and cabinet. The cart also features a granite top, drawer, open shelf and enclosed cabinet with metal accent. 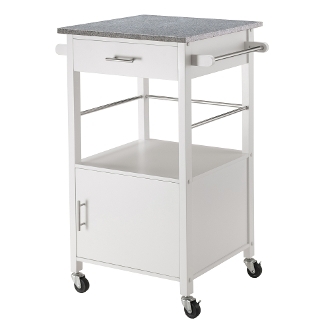 Assembled cart size is 23.2"W x 19.3"D x 34.8"H and is made with a combination of solid and composite wood in white finish. Assembly Required. Cart assembled size is 23.2"W x 19.3"D x 34.8"H; Granite Top. Cart Features granite top, drawer, open shelf and enclosed cabinet with metal accent. Made with combination of solid and composite wood in white color. Assembly required.